12 chapter cliffhanger. Stars Charles Quigley and Carole Landis.Three circus daredevils use their amazing athletic abilities to hunt down an insane master criminal played by Charles Middleman (Ming the Merciless from the Flash Gordon serials). 211 minutes of action, mystery and thrills. Trailers. Director Robert Siodmak (SON OF DRACULA) brings his beautiful photography to the dark tale of murder. A young woman is suspected of the crime....she is one of identical twin sisters. One sane, one psycho! Which is which? A top-flight chiller. Stars Charles Durning. From 1969 to the early 1980s, hundreds of "Made-For-TV" movies were produced. A great number of them were horror films and very good! From the NIGHT GALLERY, DON'T BE AFRAID OF THE DARK, NIGHT STALKER, TRILOGY OF TERROR, CROWHAVEN FARM to...this, DARK NIGHT OF THE SCARECROW. Cult classic. The early days of director John Carpenter. An astronaut on board a ship that seeks out unstable planets. They blow them to bits when they find them. Along the way a blob-like beach ball terrorizes the crew. Wild, wacky and cool. Dan Griffith documentary and loads more extras! The Science Fiction Classic on DVD! The classic. Spaceman and robot come to earth for peace, but find hostility. Michael Rennie stars in this Robert Wise directed blockbuster. Now on Blu-Ray! A strange farm owner raises killer bees and the horror starts there for a vacationing singer. Stars Suzanna Leigh (SON OF DRACULA and THE LOST CONTINENT). Screenplay by Robert Bloch. Co-stars Hammer Studio's Michael Ripper. Stars Craig Stevens, Alix Talton and William Hopper. You'll never look the same at a praying mantis again! This thing destroys buildings and eats people. Call the Orkin man FAST! Commentary, still gallery, trailer. New 2K scan. Patrick McGee in a truly first-class low-budget chiller. Suspenseful and shocking with some eerie underwater shots from a small pond and what lies at the bottom. Creepy and unsettling. Remastered great print! Two discs, Blu Ray and DVD both included. Fritz Lang expressionistic monument in movies. A young woman comes face-to-face with Death himself. She pleads for him to release her fallen fiancee. He does, but at a price. Historical footage of Persia, Venice and ancient China. Extras: restoration, commentary by Tim Lucas, re-release trailer. Stars Godzilla, Mothra, Rodan, King Ghidorah and a handful of other story-high monsters. This is one I saw in the theater with the neighborhood buddies....heck, it was an event! All those monsters, destroying every major city of the world -- sounded like a show to me. Director Ulmer (THE BLACK CAT, MAN FROM PLANET X) lends his expressionistic dark touch and makes this film a classic. A man involved with a femme-fatale is detoured into a netherworld nightmare. Documentary, interviews with actress Ann Savage, Roger Corman, trailer, 4K restoration. Also known as KILLER BATS, this flick features Lugosi hell-bent on revenge from people making profits on his inventions. He uses giant killer bats and a special aftershave that attracts them. He gives the aftershave to his enemies and... "Goodbyeeeee." HD restoration and image gallery. Stars Richard Crenna. The two kids in the film also starred together in Disney's ESCAPE TO WITCH MOUNTAIN. The family's puppy dies and is replaced by a new pup...that is possessed by a demon. The dog steals the souls of the wife and kids....Made-for-TV horror! A twisted European Jess Franco flick. A young doctor uses her evil ways to revenge the death of her father. Torture, nasty mechanical devices and an alluring spider woman dance. Extras: Trailer, commentary by Tim Lucas, English language and French language. Restored. Woman plots her husbands murder. After killing him...it appears that he has come back from the grave for revenge. The last twenty minutes of this film might be the most horrifying film of the fifiies. A shocking back-from-the-dead sequence and whispers in dark hallways. Wow! Stars Ray Milland, Grace Kelly and Robert Cummings. A love triangle that results in a murder plot that goes strangely wrong, or does it? One of the perfect Alfred Hitchcock shockers. Shot in 3-D. This blu-ray has both 3-D and 2-D versions. Two documentaries, trailer. Stars Boris Karloff and Nick Adams. Based on an H.P. Lovecraft's story. A cosmic meteor crashes to earth, bringing with it powers that can't be controlled. Karloff is trying to harness the power, but all around him vegetation...and people are rotting away...turning into monsters. HD. Stars Jeffrey Hunter, France Nuyen and Donald Woods. James Bond meets time traveling science fiction. A very 1960s fun, action-packed science fiction where a secret agent and his assistant battle an evil master mind. Extras. 3 jewel thieves hide from the law in an abandoned house...a haunted house! The ghosts are not friendly, to say the least. These grumpy apparitions begin killing the house guests in horrible ways. Long lost film plays like an early AIP Roger Corman black horror-comedy. Extras. HD 4K transfer. Producer George Pal (WAR OF THE WORLDS, THE TIME MACHINE) brings to life the classic fiction super hero, "The Man of Bronze"....Doc Savage. Starring Ron Ely. In pulp-like, high camp Doc Savage and his band of eccentric allies head for The Valley of the Vanished to save the entire world. A Hammer-looking film with a doctor experimenting with everlasting life. A really cool looking zombie is unhappy with the proceedings and rises from the grave. HD, widescreen. Lew Ayers mind is taken control by a power mad dead man. Really great 1950's version of Curt Siodamak's novel. Nancy Davis-Reagan is the slightly concerned female lead. Extras: Original trailer, "Trailers From Hell" with Joe Dante and audio commentary. Widescreen, HD. Stars Ian Bannen and George Sanders. A dark, mysterious island with unexplainable weird occurrences. Mutated giant, sea life, glimpses of inhuman man-like creatures, bodies of victims in the woods. Strange radioactive experiments or a curse upon the remote village? Quatermass-like film. Extras! Stars Vincent Price, comedy team Ciccio and Franco. Vincent Price is back in this sequel to DR. GOLDFOOT AND THE BIKINI MACHINE. This one is directed by Mario Bava. Played for sci-fi slapstick and Price eats up the scenery. Extras: Vincent Price trailers, animated Girl Bomb stills and more. Stars Vincent Price, Frankie Avalon, Dwayne Hickman, Susan Hart. Mad doc Price builds beautiful bikini clad robots to get close and personal with world leaders and wealthy men. The object, to gain control over the world. Extras: Montage of "Bikini Bots" and Vincent Price trailer collection. John Barrymore stars in this Stevenson classic. His transformations are terrific. Favorite weird scene: Hyde in a dream attacks Jekyll in bed in the guise of a translucent giant tarantula! HD 35mm transfer. Extras: 1912 version, Sheldon Lewis alternate 1920 version, Satire short with Stan Laurel. Directed by Fritz Lang (METROPOLIS), a silent age super-thriller that features master criminal, Dr. Mabuse. Ruling the city with a reign of terror and mystery. Mabuse utilizes bizarre gadgets, hypnotism and mystic powers to keep his vise-like grip over the population. 270 minutes in length! The Amicus horror anthology movie that stars Peter Cushing, Christopher Lee and Donald Sutherland. Living, blood-thirsty plants, disembodied hands, vampires all told by a mysterious fortune telling on a train. Fearful fun! Brilliant sharp transfer. Official Universal all-region Blu-Ray! Dwight Frye as Renfield is electric, Chandler is beautiful and frail as the Count's victim, Manners is frustrated and righteous, Sloan as Van Helsing is the quintessential hope that we look to....and Bela Lugosi became an icon for movie-goers forever. Official Universal all-region Blu-Ray! Bela Lugosi became an icon stamped in the minds of movie-goers forever with this film. Bonus: Includes full-length Spanish version with different actors, 3 documentaries, optional music track, David Skal commentary, Trailer Gallery and much more. Jack Palance stars in a intense study on the Prince of Darkness. This version directed by Dan (THE NIGHT STALKER) Curtis. Includes extras: Jack Palance and Dan Curtis interviews, outtakes, TV cuts, trailer, alternate audio tracks and more. The re-telling of a classic with atmosphere and style. Stars Frank Langella as the blood-thirsty count and Laurence Olivier as vampire-hunter Van Helsing. Extras include commentary by the director. Widescreen. Blu-Ray disc and digital HD. Christopher Lee as the vicious blood-sucker in this sought after Hammer flick. Special Collector's Edition. 4K scan, commentaries by Chris Lee, Suzan Farmer, Francis Matthews, Barbara Shelley, Troy Howarth. Hammer TV show, documentary, trailer, still gallery. Chris Lee's Count moves ahead from a Gothic setting to contemporary England. The vampire carnage begins again, but never fear! -- Peter Cushing is not far away...and there's the lovely Caroline Munro too. Includes trailer. We all remember the great poster and newspaper ad from this. Chris Lee (Dracula) Fangs and gaping mouth as someone is trying to stake 'im! Chris Lee is back and ticked off at the whole village! The HD blu-ray treatment for the complete Universal Dracula series: DRACULA (1931), THE "SPANISH" DRACULA (1931), DRACULA'S DAUGHTER (1936), SON OF DRACULA (1943), HOUSE OF FRANKENSTEIN (1944), HOUSE OF DRACULA (1945) and ABBOTT AND COSTELLO MEET FRANKENSTEIN (1948). Hours of bonus materials. Stars J. Carrol Naish, Lon Chaney, Zandor Vorkov, Russ Tamblin, Regina Carrol, Angela Rositto and Forrest J Ackerman. Dr. Frankenstein is holed up in a seaside amusement park, complete with laboratory. Lon Chaney Jr. is Groton, doing a Lenny-type. The monster and Dracula in immortal combat. 95 preview trailers...hours of horror! Loads of Hammer Films in there. 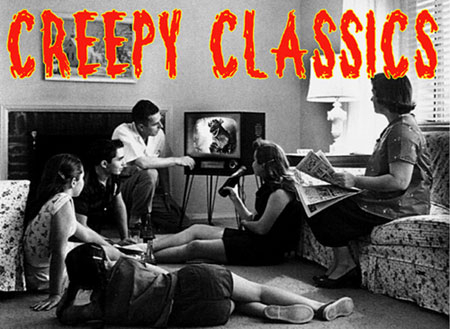 A perfect collection of 1960s-1980s era horror movies. A tribute to the twilight days of drive-in horror double-bills and dusk-till-dawn creature feature spook shows. 3.5 hours in HD! Two AIP shockers: MURDERS IN THE RUE MORGUE (1971) starring Herbert Lom and Jason Robards and THE DUNWICH HORROR (1970), an H.P. Lovecraft chiller with Dean Stockwell and Sandra Dee. Extras include featurette, commentaries, trailers.